The Village Blend has become one of the top spots for couples to meet up through a popular new dating app. Clare Cosi who manages the coffee shop has mixed emotions about this. Of course she’s happy for the increased business, but has strong reservations about the possible dangers of so many people looking for love through an app. When a woman’s online romance sours, she confronts him with a gun at the Village Blend and the video footage goes viral, and the negative publicity drives both old and new customers away. When Clare gets involved in a murder investigation, she comes up with a plan to catch the prime suspect and get her business back on track. However, things don’t turn out as Clare expects and the investigation grows more and more dangerous for Clare and those she loves, but she won’t rest until the killer is brought to justice. Even though Shot in the Darkis the seventeenth book in the series, it’s able to be enjoyed equally by old and readers alike. The author does a great job of including the background information about the characters and their complicated relationships. For example, Clare’s business partner is her ex-husband, her boss is her ex-mother-in-in-law, and her daughter dates her new fiancé’ NYPD partner! Important details are seamlessly blended into the story to inform new readers without boring those who follow the series more closely. I’m only a casual reader of the series, so I appreciate the reminders. I like the character of Clare and her relationship with New York City Detective Mike Quinn. They are friends and have great chemistry. I also enjoy the rapport between Clare and her ex-husband Matt. Underneath his flirtatious remarks and Clare’s rebuffs, their underlying friendship shines through and each knows they can count on the other when it really matters. In this installment, Clare enlists the help of both Mike and Matt in this investigation which uncovers a murderer and the dangers and disasters of the “swipe to meet” dating culture. The motive behind the murder is more complex than it first appears and makes things a little more complicated than they need to be, but all is resolved after a couple of tense confrontations. The murder investigation kept me guessing about which one of the unpleasant suspects was really the killer. On the other hand, the mystery surrounding Clare’s daughter’s boyfriend was obvious to me and should have been to Clare, too, so for me that side plot fell flat. Overall, I enjoyed the book, including the recipes and information about making espresso and flavored syrups at the end of the book. 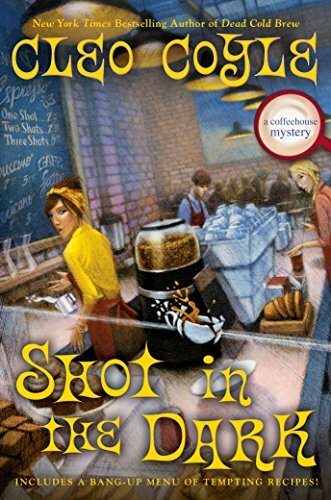 The situations are a bit edgier than some culinary mysteries and will appeal to fans of Diane Mott Davidson. Thanks for the review. Sounds interesting with lots of suspense & intrigue. It’s going on my TRL. Thanks.